A set of 500 cards to accompany bottles which 78Swim is using in a marketing initiatives. 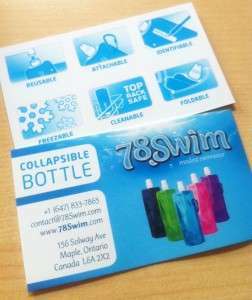 The design on the backside of the card shows the bottle features while the front has contact information. The promotion for a free bottle with the purchase of a swimsuit is running all summer. Orders can be placed online at 78Swim.com. If you’re looking to have cards printed and designed, rates start at $100 for printing and design. Contact us to learn more.